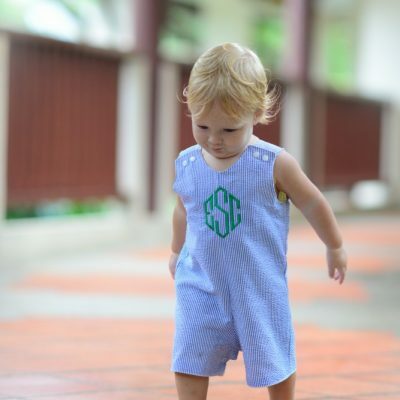 Boys cotton onesie or shirt with “uno”, “dos”, or “tres” appliqued on it and green seersucker shorts to match. You can order the complete outfit, or just the top or shorts. There's also the option to add a monogram or name! Price adjusts in bottom right corner based on your selections. Shipping Class A (see shipping options in cart at checkout). Our first birthday outfit is perfect for birthday numero uno (or dos or tres.. it can be customized)! This appliqued uno outfit is perfect for a festive birthday! Choose to get the onesie or shirt. Then add the shorts to make a complete outfit! The green seersucker shorts can pull double duty and match white, navy ,or green tops you already have as well. OPTIONS: You can order the top, add a name, and/or add the shorts. You also choose which birthday it is (could be 1st, 2nd, or 3rd.) The thread color and font you select would be for the name or initials embroidered on the outfit under the uno, dos, or tres. If you select No shirt or No Shorts it will take that amount off of your total, the price adjusting in the bottom right corner.